The nasty, cutting coalition of the left-liberal imagination is showing itself to be anything but. Why else would George Osborne’s announcement that he is to cut £12 billion from the welfare budget after the next election cause such cabinet unease? Nick Clegg isn’t best pleased; and the welfare and pensions secretary, Iain Duncan Smith, is apparently resisting anything other than the snail-pace reform that has so characterised the introduction of his much-maligned universal credit. ‘Sources’ contrast the Chancellor’s brutal-sounding ‘lopping off narrative’ with the slow and steady approach of Duncan Smith. But, in truth, the details we have so far suggest that the political elite as a whole lack the cojones to see it through. As commentators point out, cutting housing benefit for under-25s and targeting the relatively well-off who live in social housing isn’t going to make much difference. While the Lib Dems and Labour opposition are almost enthusiastic in their desire to deny old people of their pensioner benefits (winter fuel allowance, television licences, bus passes), the aged Tory heartland seems to have dissuaded even ogre Osborne from considering such an attack on the ‘vulnerable’ – an imaginary group that cuts-phobic left-liberals usually fall over each other to patronise. On the other hand, while those urging the government to cut much more are right to worry that the measures taken so far, and those so far proposed, are not even nearly up to the task of balancing the books; they are wrong to think this is the biggest problem. Cutting welfare and other public spending is not going to make the economy grow; nor will it make the dependent any more independent. The point of ‘lopping off’ chunks from welfare spending should be to realign the workings of the benefits system with a new way of thinking about the relationship between the state and the individual. 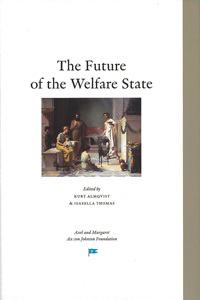 Instead of spending a quarter of public spending on entangling people in a long-term relationship of passive dependency, something that none of us can afford – financially or morally; we should be building a consensus around the popular view of welfare as nothing more than a safety net, a stop-gap, a contributory system of mutual social assistance. The flip-side of the welfare coin is, of course, the world of work. So those critics who want to scrap a jobcentre ‘service’ that tries and fails to both administer out-of-work benefits and help people get off those self-same benefits have it right. The unemployed, as Demos argue, should be free to choose their preferred job broker or, dare I say it, should go it alone and find work themselves. And yet in their eagerness to squash the myth that claimants are defrauding the benefits system, Demos wrongly argue that many of those who should be claiming benefits aren’t. And therefore the state owes them something. They come up with a figure of £5 billion a year. This may or may not be technically speaking the case but I’m not sure it’s helpful. There are lots of people out there who don’t feel entitled even if Demos says they are. They don’t want to live off the state; they would rather support themselves and get by without the hassle and intrusion, all for a pittance. That’s no bad thing, and the sooner the political class stop fudging the issue the better. The following is an edited version of a speech given by David Clements as part of ‘Cuts, cuts, cuts: what, where and why?’, a debate at the recent Battle of Ideas festival. I’m not a big fan of ‘the cuts’. They may be necessary, given the parlous condition of government finances, but they are hardly going to make public services any better. With the possible exception of the police, where a fall in crime has continued despite recent cuts, the services we receive are likely to get worse. Moreover, such cuts won’t solve the economic crisis. Take local government. In the past few years, local government has been at the forefront of UK public-spending cuts. The funding that councils receive from central government accounts for around a quarter of public spending. Councils have already seen their funding cut by somewhere between just over a quarter and a third, depending on who you ask; and there will be another 10 per cent cut in 2015. The chair of the Local Government Association has described councils as the ‘hardest hit’ organisations in the public sector. Critics say that councils can draw on their reserves, raise council tax and – most controversially – increase various charges, fees and penalties for everything from car parking and speeding to planning applications and licensing. No, the biggest problem I have with anti-cuts lobbyists is that they insist that everybody is ‘vulnerable’ and won’t be able to cope if the state isn’t there with a safety net. So, like the representatives of local government, people with disabilities (once a bolshie bunch that would tie themselves to railings to publicise a political issue), or at least those campaigning in their name, routinely describe themselves as the ‘hardest hit’ by cuts to local services and welfare reform. Women, too, once championed by equally bolshie groups of feminists, have been turned into special victims by today’s campaigners. Indeed, the police and domestic-violence campaigners, not satisfied that a fall in crime in general, and in domestic violence in particular, is a good thing, have joined forces to claim otherwise. So under the headline ‘Police referrals of domestic-violence cases drop 13 per cent’, we learn that this is not at all welcome but is in fact ‘alarming’. Obligingly, the shadow home secretary blames spending cuts for this outrageous failure to find more alleged abusers to haul before the courts. There is a lengthy queue of groups claiming to be the worst-hit by government cuts. The British Medical Association claims cutbacks are increasing child poverty, making familiarly dubious claims about children’s wellbeing and concluding that if we were ‘failing our most vulnerable children’ before, we certainly are now that we’re cutting welfare and children’s social care. Another claim is that cuts to school breakfast clubs mean that parents are unable to feed their children before they go to school – which makes you wonder what parents did before breakfast clubs first appeared in the 1990s. The Organisation for Economic Cooperation and Development (OECD), basically an international club for the world’s developed countries, claims that the cuts will widen inequality. Here, the OECD joins a long line of organisations and commentators taking a swipe at old people, who it claims have largely escaped the hardships so far. In contrast with all the victim-talk for other groups, we are reminded that nearly half the money spent on benefits goes on the state pension, and there is a cross-party consensus that pensioner benefits will be means-tested after the next election. The Department for Work and Pensions (DWP) budget, accounting for nearly a quarter of all public spending (£166 billion per year is spent on benefits) certainly has a lot to answer for. The DWP is undermining all of the cutting going on in local-government and central-government departmental budgets by doing too little to trim the benefits bill. Housing benefit is the second most costly of all benefits after the state pension – it has risen to £24 billion this year. The government aims to cut this by £500 million per year. There is a benefit up-rating cap of one per cent in place until 2015/16 aimed at saving £3.1 billion in working-age benefits. And the introduction of Universal Credit (to replace many of those working-age benefits) is supposed to save £38 billion by 2023. There are clearly attempts to solve the problem, but they don’t look like being anywhere near enough. So you might expect that there would already be a battle of ideas happening about the welfare state and how we go about making it affordable, if we choose to keep it at all; but no such debate is taking place. Instead, there is a lot of noise about how ‘vulnerable’ claimants won’t be able to cope with the benefit cap, Universal Credit, the ‘bedroom tax’ and the demands of the Work Programme. There is no discussion of the idea that it might be unfair to expect a life on benefits to be more rewarding (financially at least) than being in work. Or that people shouldn’t be subsidised by the state to live in houses that are too big for them or that they can ill afford. Or that young people not in education, employment or training shouldn’t be living off benefits. Apparently, they too are vulnerable. According to opponents of the Tory proposal to cut benefits to the under-25s – one I happen to agree with – 18- to 24-year-olds in receipt of benefits tend to come from broken families or might be abused if they go back to live with their parents. Despite the often hysterical claims, these sorts of policies, in my view, are worth supporting. But there are no easy solutions to what is a complex and long-standing problem. The public sector is still far too big, with public spending currently equivalent to 44 per cent of UK economic output. Nevertheless, there are trends which mean that the state will inevitably have to grow further in order to accommodate the increasing care needs of an ageing population. The only cap planned for social care will be on how much individuals have to pay for it before the state steps in. To ease the pressure on housing and housing benefit we need hundreds of thousands, if not millions more homes to replace an inadequate, ageing housing stock. And if we do get back in the business of building things, the anti-free school lobby – while wrong about free schools themselves – are probably right about the need to build more primary schools. With these pressures for increasing state expenditure, surely we need to think about what might be cut elsewhere? To conclude, we have the peculiar situation of the government doing a lot of cutting in some areas, only to see spending getting out of control elsewhere. And at the same time, we have this hysterical over-reaction on the part of the self-appointed defenders of ‘the vulnerable’ who, apparently oblivious to how serious the fiscal situation has become, think the cuts have already gone too far. There is a grown-up debate to be had about public services and the welfare state, and we urgently need to have it.